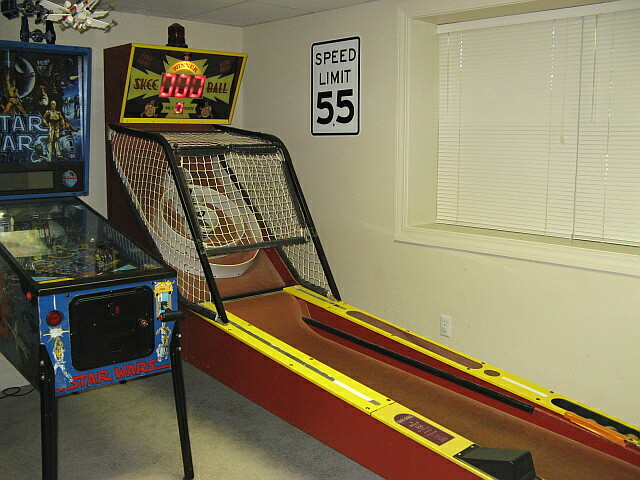 Using my wife’s interest as an excuse, many years ago I purchased a SkeeBall model H game. This 13 foot monster has resided in the corner of our basement ever since. Over the years we’ve played countless games on it as have a lot of guests. As I’ve progressed in my electronics hobby I started thinking about what it would take to replace the old control board from a pure how-do-you-do-that perspective and to also add some customized sounds and attract display just for fun. The Skeeball Controller presented here is the first generation of the control board that I have created. 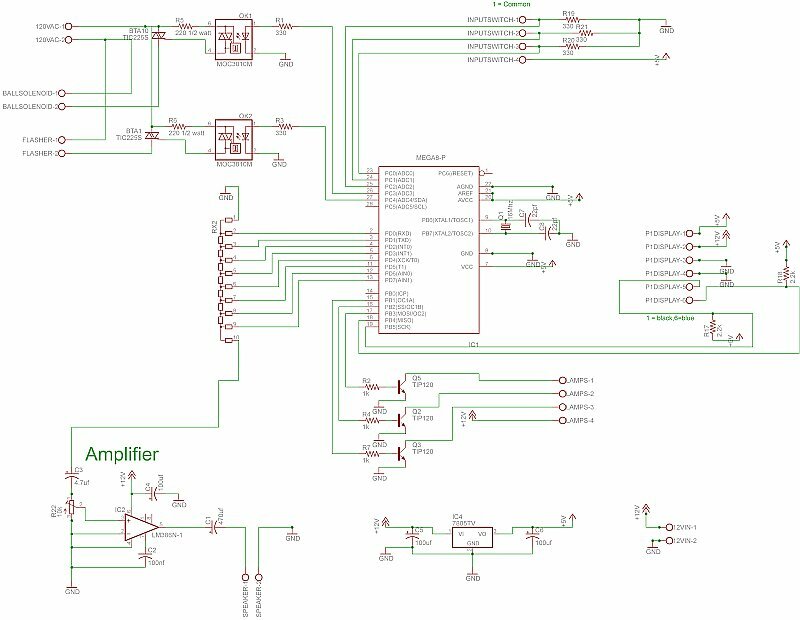 The biggest challenge of this project for me was getting a microcontroller to play music. I’ve never had to deal with generating anything analog, had no prior knowledge of sound/music to speak of nor have I ever had to deal with amplifiers other than plugging things into the back of a home stereo. What I did know is that I wanted this controller to play some nostalgic arcade tunes instead of the stock Skeeball ones. A little Google surfing, and AVRFreaks.net trolling lead me into some deep waters of sampling wav file and other things that will be cool to figure out, but seem over blown to generate the PacMan theme. I also didn’t want to have to deal with any data storage components which would be necessary to hold all that data. I then found some RTTTL ringtones of classic arcade games on this site : http://arcadetones.emuunlim.com/ . Check out Wikipedia for a great explanation of the format : http://en.wikipedia.org/wiki/Ring_Tone_Transfer_Language . So now I had a ready source of arcade tunes rendered down to what frequency/tone to generate and for how long. Generating a signal to drive an amp/speaker was the next step. I’ll spare you the process as you can Google that just as easily as I can, but basically the common ways to do this are to use PWM (pulse width modulation) off of a single pin running at the given frequency, or you can use a R2R array of resistors to generate the signal sampling from a pre-sampled waveform pattern (in this case a sine wave). I chose the R2R method since I had the pins to spare and it also generated the purest waves for me on the oscilloscope. The existing display in the Skeeball game is comprised of 4 7-segment displays generated by small 12V lamps. The display has some driver circuitry built-in comprised of a series of 74c164 shift registers feeding uln2003a’s which in turn control the individual lamps. 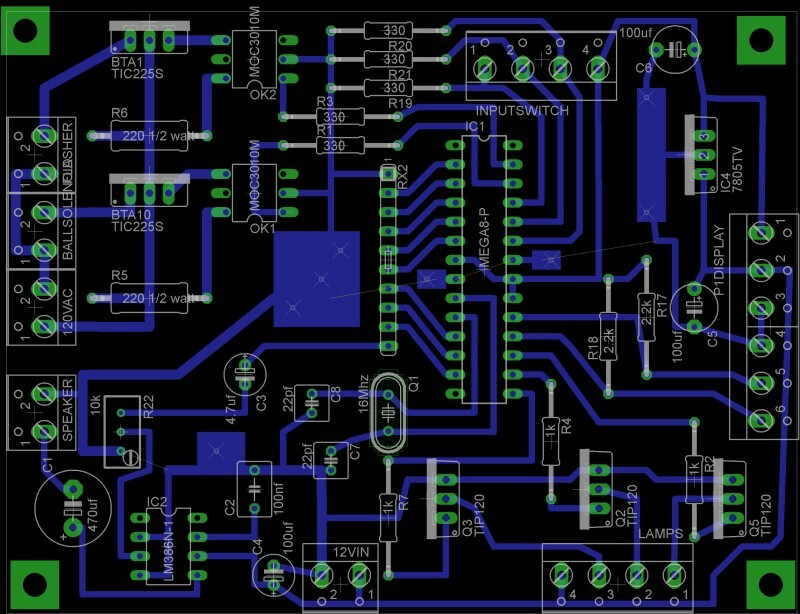 All of this plugs into the existing board via a 6 pin connector representing 12V and ground for the lamps, 5V and ground for the control along with separate data and clock lines to feed the data into the shift registers. The biggest trick here is that those 74c164’s are CMOS level not TTL which means that they need a lot closer to 5V to register a high. To accomplish this a pull-up resistor had to be used. Don’t worry, if your interested you’ll see it on the schematic. The other outputs are 2 120V AC outputs (solenoid and top light) and 3 12V DC lamps. 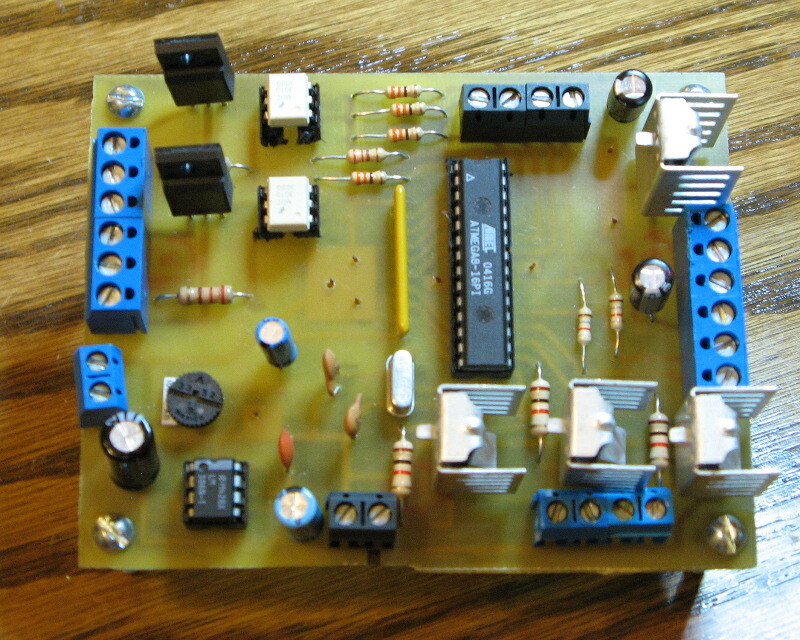 The circuitry to drive the 2 120V outputs are the same as the one’s I used on my traffic light controller detailed on this site. It’s nothing more than using a pin to feed a opto-isolator (MOC3010) which in turn controls a triac (BTA10). The only difference in this application is the inclusion of an in-line fuse on the solenoid line just so it doesn’t burn up in case of a malfunction. The three 12V lamps are driven by three TIP120 power transistors. In the board pictures below you’ll see them shrouded in clip-on heat sinks. Inputs for the game are comprised of seven normally open contact switches. One for the start switch (I hot wired a start button on the front of the game long ago bypassing the coin mechanism). One switch lies in the ball out trough indicating when a ball is out of play. The other five switches lie behind each of the five scoring holes (10,20,30,40,50). All five scoring switches share a wire pair, so in order to tell what score you made on a ball we need to keep track of the number of pulses on the scoring line before the ball activates the ball out switch. The circuitry to pull this off is bread-and-butter stuff if you’ve ever messed with a microcontroller. The software is the fun part of this since it has to handle switch debouncing and keep track of all of the game logic. Call SetTune() to load the RTTTL info. I know that sounds confusing, but chances are if you are still reading this then you are trying to implement something similar. Keep staring at it. The rest of the code is all based around the 31,250hz timer, counter-timers and flags. Switch debounce is handled in code. I’ve included comments in the code which should help try to make sense of it if you are interested. Here’s the current code: skeeball.c . It works! Check out a video of the display on YouTube here : http://www.youtube.com/watch?v=T53lwfgze00 . It’s not perfect though. I have a hiss/crackle in my sound system now that seems to be tied to the lamp changes. For the next generation of this project I’m going to work with separate power supplies and/or a new power amp chip to try to fix the problem. Other than that it’s a fully functional replacement for the original control board with some customizations. More sound – ramp up to wav/mp3 files with external data storage. Replace the existing rollover switches with no-contact IR beam switches. If you have ideas or comments please let me know.